Patio, decking, and pathways overrun by slippery green mould, algae, and moss? You need Simply Spray and Walk Away! A moss, mould, and algae remover that does exactly what it says on the tin, Simply Spray and Walk Away clears up almost any hard surface after just one application, keeping your patio, driveway, paving, and more looking spotless for up to 6 months. 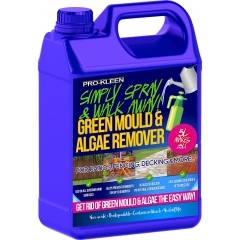 Suitable for use on paving, patio, decking, plastic, glass greenhouses, sheds, terracotta, roofing, and even on the caravan, our range of green mould and algae removers are versatile and practical. 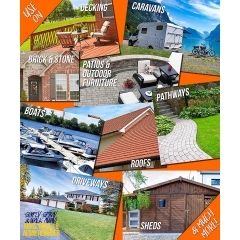 Use almost anywhere in your garden and get the same amazing results every time. Designed right here in the UK to be as easy to use as possible, regular Simply Spray and Walk Away only needs to be diluted and applied with a pump sprayer or a watering can. 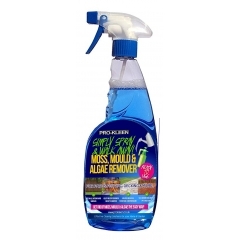 If you want an even easier mould and algae remover, Simply Spray and Walk Away Ready to Use comes pre-mixed and ready to apply straight from the bottle! Not only does our range of moss, mould, and algae removers provide you with quick results for a cleaner garden, they can also create a barrier which prevents those slippery growths from coming back.